Treat your skin to a treat of exfoliating salts nurishing and conditioning oils. 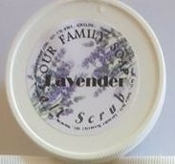 Scented with Lavender essential oil tohelp you to relax. Contains: Dead Sea Salt, Sodium Cloride, Epsom Salt, Sweet Almond Oil, Coconut Oil, Lavender Essential Oils, Lavender flower buds and Plant Based Vitamin E.